All ropes have to be inspected before, during, and after all operations. Kernmantle rope is harder to inspect than a laid rope. I.e. green line. The Assault Climber must know what to look and feel for when inspecting a rope. Any of the below listed deficiencies can warrant the retirement of a rope. xcessive Fraying. Indicates broken sheath bundles or PIC breakage. )Uniformity of Diameter / Size. May indicate core damage, noted by an obvious depression (hour glass) or exposure of white core fibers protruding from the sheath (puff). iscoloration. A drastic change from the ropes original color may indicate chemical change or damage. Stiffness or Soft Spots. Could signify core damage. NOTE: Dynamic ropes measuring between 10mm and 12mm are marked at each end of its pigtails with a number "1" indicating that the rope is UIAA approved for single rope lead climbing. Dynamic ropes measuring between 8mm and 9mm are marked at each end of its pigtails with a "1/2" number indicating that two of these ropes are required to conduct a lead climb. 4| (5 Min) ROPE LOG. The purpose of the Rope Log is to maintain an accurate record for the use of each rope contained within the Marine Assault Climbers Kit (MACK). Due to the turnover of personnel, and the fact that no one person may have the same rope twice, the rope log is used to ensure the safe use, serviceability, and account of each rope. Serial number. By assigning each rope a serial number, responsible units can determine information about a rope. As soon as the ropes are cut to the desired length for their intended purpose, each rope will be assigned a serial number by the responsible unit. That rope should then be labeled with that serial number in some permanent manner. The best method for this is as soon as the ends of the new rope have been whipped and fused, mark both ends of the rope with the serial number and then dip the ends of the rope, in effect, laminating the serial number to the rope ends. 2 Last two digits of the year the rope was manufactured. Each rope has a shelf life of two years, after that it must not be used for any mountaineering purpose. 3| Four-digit number for that individual rope which is assigned by the responsible unit, and should be assigned sequentially as new ropes are issued out. 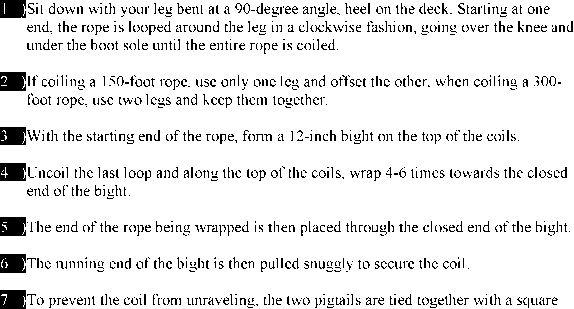 4| The length and diameter of the rope. The length may be recorded in feet, and the diameter in millimeters. Example meaning: This rope is a 150 foot, 11mm, static rope, manufactured in 1996. It is the first rope issued by Fox Co 2/8. anufacturer. Depending on the manufacturer, ropes of the same type and diameter may vary in tensile strength, stretch factor, and durability. ate of manufacture. Five years from this shelf life date, ropes are considered to have reached their normal expiration date, and should be destroyed. ate in service. This is to be recorded for tracking purposes to establish how long a rope is in service. Two years is considered maximum rope life in service. ^^Each time a rope is used, the using unit is responsible to record how that rope was used and how much use the rope received. Additionally, before checking out a rope and prior to turning it back in, the rope must be inspected by qualified personnel, and initial in the "Inspected By" block of the rope log. 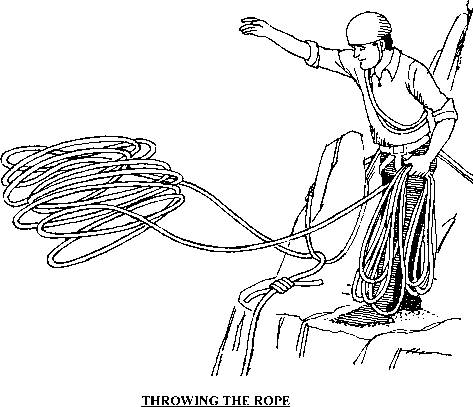 NOTE: ANY TIME A DYNAMIC ROPE IS SUBJECTED TO A FALL FACTOR 2, THAT ROPE SHOULD NOT BE USED AGAIN FOR MOUNTAINEERING. TRANSITION: Are there any questions over the care of a rope or rope log? Now let's discuss the various ways of coiling a rope. 5| (10 Min) COILING A ROPE. There are two types of rope coils frequently used at MWTC. The Mountain Coil and the Butterfly Coil. b. Butterfly Coil. This method is used for carrying a rope when the individual needs to have maximum use of his upper body, (i.e. while climbing), without the encumbrance of a large rope coil hanging across his chest. 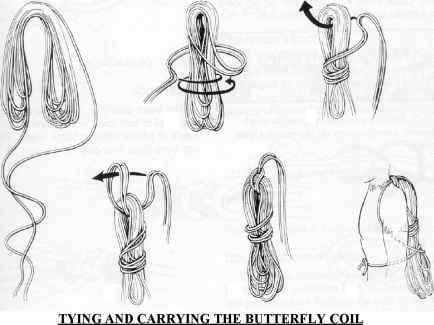 (1) Coiling the Butterfly Coil a)Step 1: Find the middle of the rope, then form a three foot bight laying both ropes in the upraised palm at the two foot point. Step 2: Form another two-foot bight with the running end. 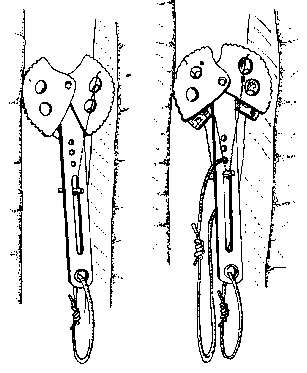 Place the rope at the two-foot bight along side on top of the original bight ensuring the running end is on the same side as the original bight. )Step 3: Continue making two foot bights, laying them alternately into your palm until there is only six to eight feet remaining. At that point, begin wrapping the two pigtails horizontally four to six times at the mid way point of the ropes in a bight from bottom to top. )Step 4: After completing your wraps, form a bight with the remaining pigtail and then thread it underneath your palm and upwards to one-foot above the coiled rope. ¡Step 5: With the remaining pigtail, thread it through the one-foot bight in step four. ^^Carrying the Butterfly coil. Separate the running ends, placing the coil in the center of the back of the carrier, then fun the two ends over his shoulders so as to form shoulder straps. The running ends are then brought under the arms, crossed in the back over the coil, brought around the body of the carrier and tied off with a square knot at his stomach. TRANSITION: Are there any questions over coiling and securing a rope? Now let's discuss how to throw the rope down the cliff face. 6| (5 Min) ROPE THROWING. To insure that the rope will not get tangled when deployed, certain steps must be taken. 9 With a stacked rope, anchor off the standing end. b Take the opposite end of the rope and make 6-8 coils and place them in your strong arm. These wraps will serve as a throwing weight that you can aim. 3 10-15 feet from the strong-arm coils create a second set of 6-8 wraps and place them in your weak arm. Q From the edge of the cliff, sound off with the command "STAND-BY FOR ROPE". Just before you release the coils, sound off with the command "ROPE". At that time drop the weak arm coils from the cliff. 9 While taking aim, throw your strong-arm coils overhand or sidearm hard enough to hit your intended target. [| If the throw was misdirected due to wind, tree, etc., reorganize and attempt to re-deploy the rope. TRANSITION: Are there any questions over throwing the rope? Take a 5 minute break and then get around the rope corral with your sling rope. 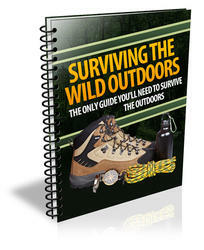 Now we will discuss mountaineering knots, their uses, and how to tie them. SMO INSTRUCTOR NOTE: Tell the company that you will cover as many knots as time allows. All other knots will be taught by that company's instructor team throughout the core package. How to coil a climbing rope?